How do we promote life-long learning and literacy? How to do we help youth to thrive educationally? High School Art Competition at The EXibit March 8 gala from 6-8 pm. Show runs through March 30. Collecting funds for snack and breakfast items @ District 54 in Morris. 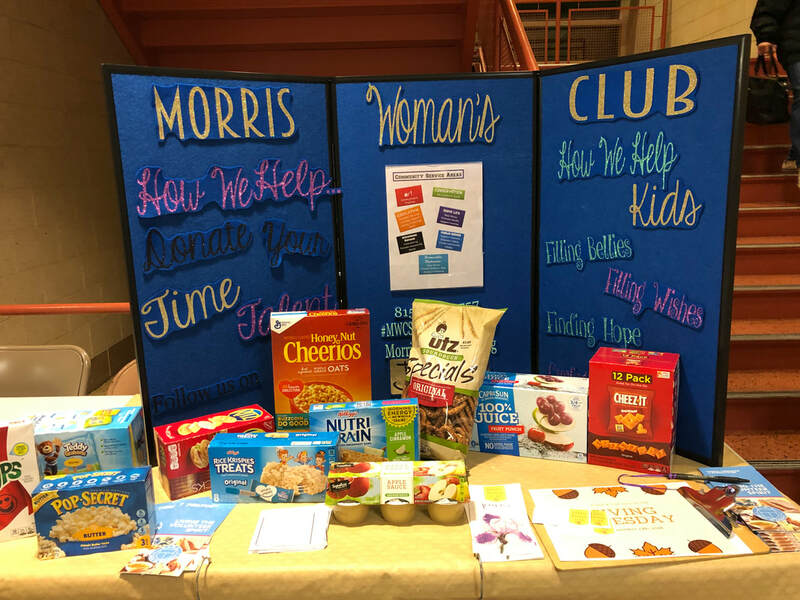 MWC was one of the community resources at the Morris Elementary Parent Teacher Conferences in November of 2018. The Club is assisting the district in collecting snacks and breakfast items for students in need. 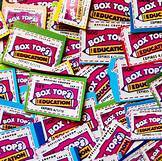 Every month we collect Box Tops for Education that we send in to schools. 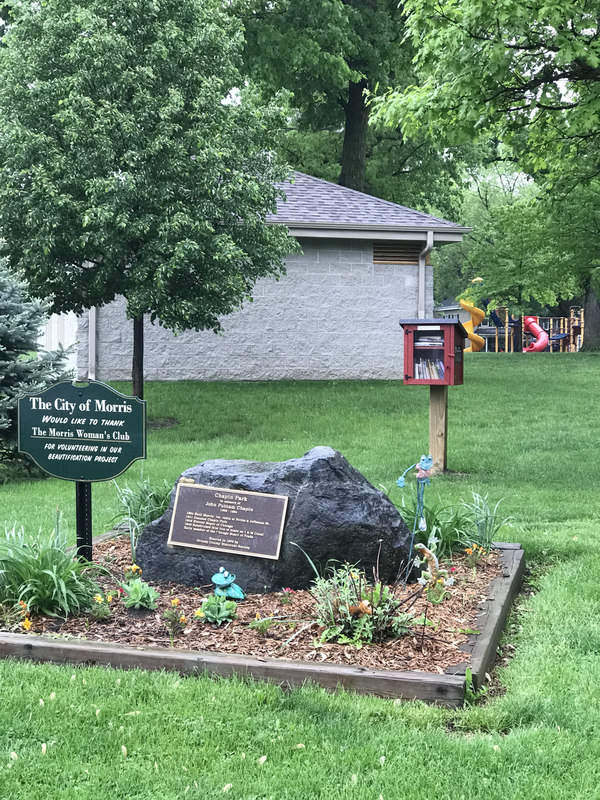 The garden at Chapin Park that MWC maintains is next to the LFL. Next the club will be working on donating a bench. We have been saving recycled lids and caps for several years. HOBY is a leadership seminar held throughout the country for sophomores of any gender to teach them leaderships skills to Empower, Lead, Excel. This organization is partnered with GFWC. If a student is interested, they can talk to their school counselor to see if there is a scholarship available. If not and they would still like to attend, they can self-register through MWC or on their own. This seminar is a great wait to cultivate leadership skills that last a life time. The nonprofit Population Connection operates a student video contest for 6th and 7th graders across the world. 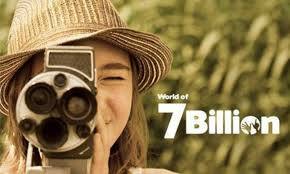 The population on earth is now seven billion and expected to grow to nine billion by 2050. What's that mean for resources? How do we keep the planet healthy? How do we feed everyone? These are great questions that students are tackling. Click on the button to see 2017 winners, and better yet, encourage your favorite teachers to get their students involved. 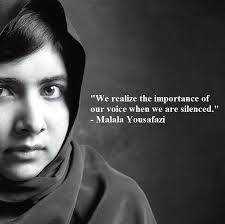 What a fun way to use the digital voices that modern kids have in a powerful and meaningful way! Similar to last year, the participants were exposed to kickboxing, which is a fun way to increase a person's heart rate. 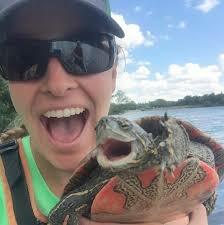 Not only is it fun, but it may help females to feel empowered. After increasing their heart rates, it was time for the girls to learn how to use stretching to tone, strengthen and lengthen their muscles. Better yet, they learned how to calm their minds. There is a scientifically linked connection between the gut and the body. It's called the second brain. The girls learned how to cook some nutritiously dense food for themselves. Failure is Not a Four Letter Word! Failure isn't a word many of us care to use about ourselves. However, failure actually drives innovation and to fail means ultimately there will be success. 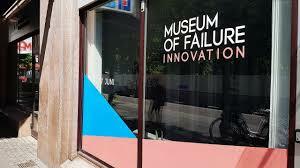 This concept is at the heart of the Museum of Failure in Sweden. It is here that such products as a Beta tape player, Trump Game, and a creepy talking doll reside--you name it, and the failure is represented. Even if you can't get to Sweden, you can see exhibits in Las Vegas ad Las Angeles. Get on board the failure train and see how risky and rewarding innovation can be. 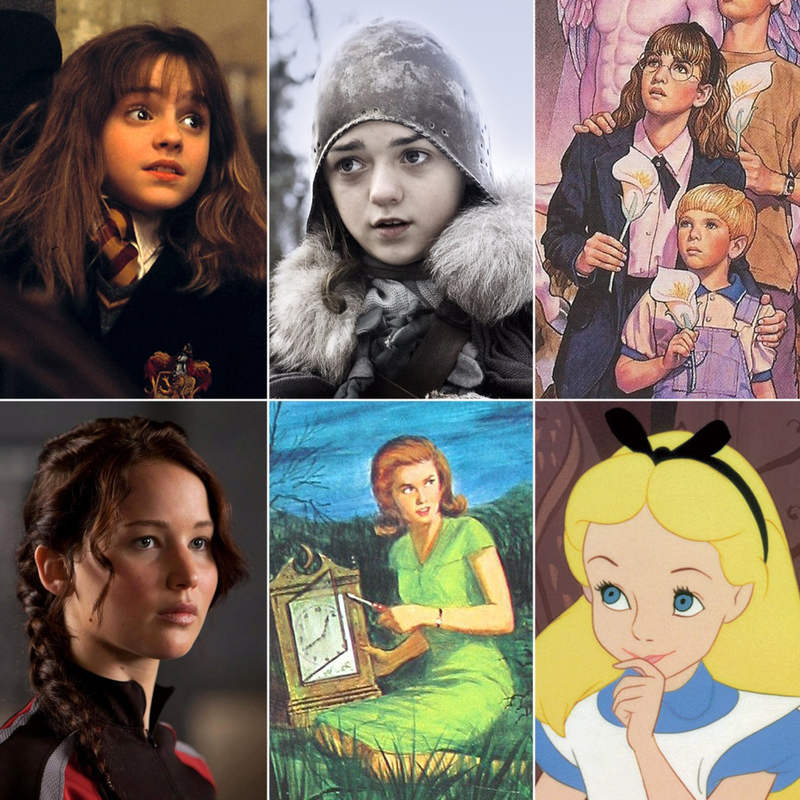 ”The bravest and brainiest girls have been breaking rules for 150 years.” Check out these books about girls who empowered themselves. Who wouldn’t want to be as cool as these heroines? From Nancy Drew to Hermione to any new young plucky female coming down the pipe. These novels can inspire the girl in you go out and be a problem solver! #herometoo. So you are bored as your driving. Or maybe there’s nothing on the tube today. Or maybe you just want to learn about new stuff and have a curious mind. If so you might be a podcaster. Here are some great ones to check. They run the gamete of making sense of ideas and life. There is so much more to food labels than in the past. So how is a person supposed to know what to do? Here is Green America’s guide to food labels. If you are interested in how to read certain information and what it means, this should help. But wait there’s more to understanding food labels. We all know we are supposed to cut back on sugar, but sometimes that’s easier said than done. For example any processed food you buy may include two to five types of sugar, which may be harder for you to recognize when a food has sugar in it, words such as maltose, molasses, sucrose, high fructose corn syrup, anhydrous dextrose, brown sugar, cane juice, honey, lactose, fructose, etc. Some processed foods even have 2-5 of these different type of sugars in them! What's a consumer to when trying to avoid so much sugar? Try buying processed foods that have less than five ingredients. That may be a person’s best way to avoid hidden sugars. Winter White House? What’s That? Ever wonder about where Presidents go in the winter? Like the rest of us, they sometimes look for respite from the cold. This Smithsonian article provides insight into the latest location Mar-a-Largo but also illuminates other locations. On November 27, 1895, Alfred Nobel signed his last will and testament giving the bulk of his fortune for annual prizes in Chemistry, Physics, Physiology or Medicine, Literature and Peace. The Economic Sciences prize was established in 1968 by the Swedish National Bank. To date there has been over 900 Noble Prizes awarded to men, women, and organizations. About 19% of the awards have gone to women. Most in the field of medicine, literature and peace. 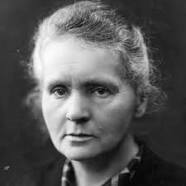 Madame Curie, one of the most prominent women in chemistry won the award twice for her work in radiation. She was the first woman to win the award in 1903 and then won a second one in 1911. Her daughter also won an award in 1935 for chemistry. Clearly a talented family! The Breakthrough Junior Challenge from Khan Academy is a chance for a child to win a $250,000 college scholarship. To enter, a child should create a short video (three minutes or less) explaining a challenging concept in physics, mathematics, or the life sciences in an engaging, illuminating, and creative way. Anyone ages 13 through 18 is eligible. In addition to awarding a college scholarship to the winner, the Breakthrough Junior Challenge will give the winner's teacher a $50,000 prize and the winner's school a new $100,000 science lab. The winner also will be invited to an awards ceremony where the prize will be presented in front of the superstars of science, Silicon Valley, and Hollywood. 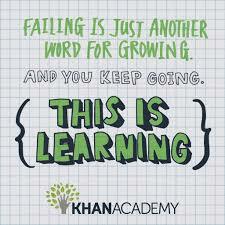 Khan Academy is a nonprofit website dedicated to helping anyone learn anything. Check it out! A young female biology graduate, Cindy Wu, started a crowd fundraising platform for small experiments that would never get big money grants to fund. The site is called Experiment. It's a place were the public and researchers (amateurs and academic) can easily interact for small grants. The platform has been a source for over $7 million dollars worth of funding, supporting over 700 projects. 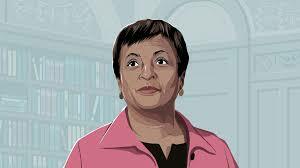 Click on the l;ink if you want to learn more about this great crowd sourcing project. Skilled craftsman are retiring at an alarming rate, and there are not enough trained individuals to take their place. So Norm Abram from This Old House fame and Mike Rowe from Dirty Jobs fame are rallying support for scholarships and opportunities for students wanting a hands on future. Many students and their parents do not know the long-term outlook for the trades and so may not think about helping their son or daughter pursue that career path. To learn more about these opportunities check out the mikeroweWORKS (MRW) Foundation Work Ethic Scholarship Program, which supports training for students. 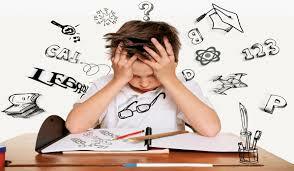 Over 20% of the population in America is dyslexic. For these people certain tasks that others naturally accomplish in their left side of the brain are more difficult. if you are that person OR are raising that child, here is a great resource for you! Khan Academy was started by a loving uncle to help teach his nephews about math. It is now one of the largest free sources of learning on the planet. It is my "go to" place to learn just about everything! Check out the Crash Course series (my favorite), but there is so much more. 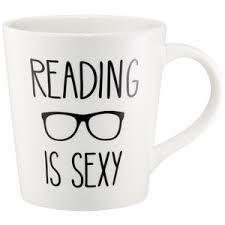 Appropriate for any age group. 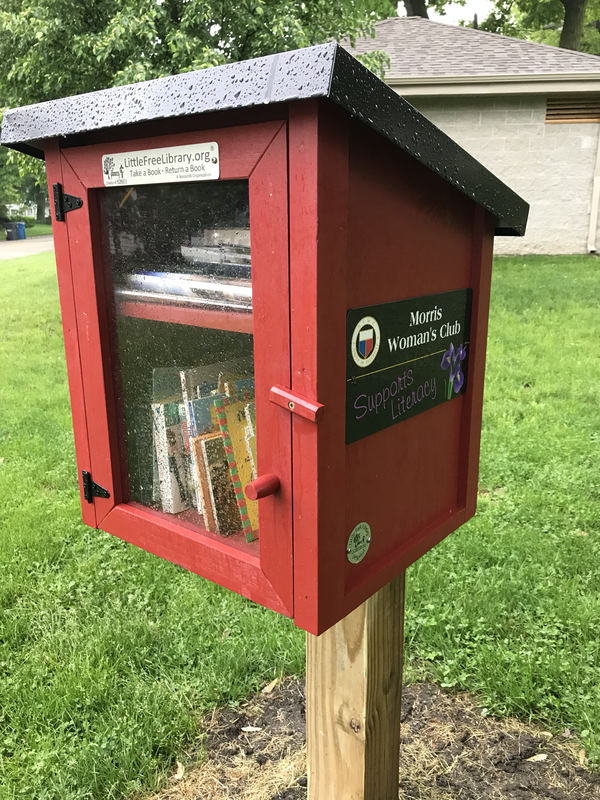 So even the GFWC has a Little Free Library. Let's join the movement! 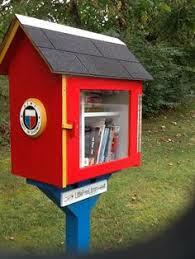 What a great way to share some books you love and the joy of reading with friends and neighbors. Build your box today. MWC provides scholarships for summer enrichment for a student to attend the Illinois Leadership Conference and also provide funding for a student to attend a summer camp for the fine arts--either music, band or speech team. These funds are raised through a Bridge Marathon operated throughout the winter by a member. Those who love bridge, enjoy theri social time but also raise money for these special scholarships. If you are interested in learning bridge, regardless of whether you are a MWC member or not, please contact us to learn more. We will also be offering lessons this upcoming year. ​This year we are giving away several scholarships to send high school students to summer camps. The recipient of our $300 Music/Speech/Art Scholarship this year (Kaitlynn Baxa) is going to be attending a drum major camp with Smitch Walbridge Clinics. She was recommended to us by the band director at the high school. We also offer a $300 scholarship to a student to attend a leadership summer camp. This year, the camp is only $200 so we have an additional $100 in the budget. The speech teacher has reached out to us with multiple students seeking to attend speech camp this summer, which is many more than we have had in the past. She let us know that speech camp information came out about the 3rd week of April. 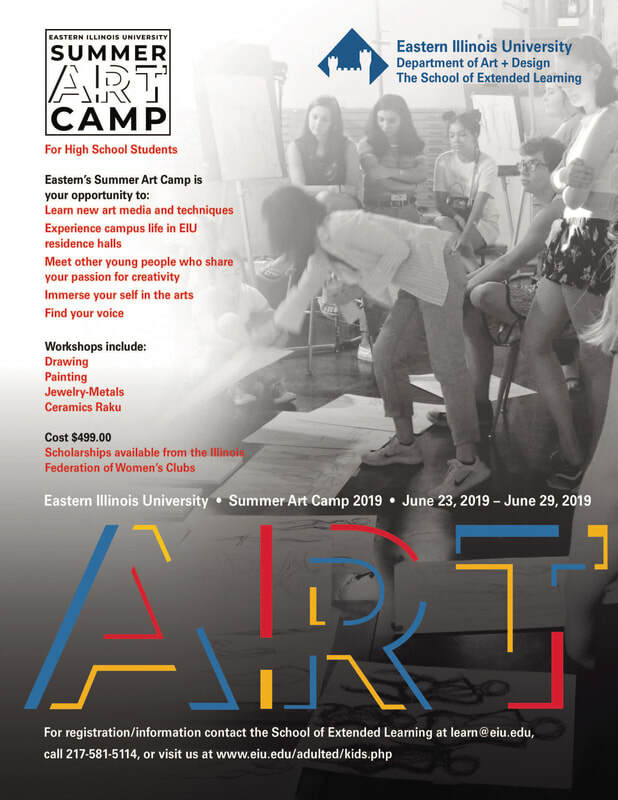 Lastly, we are sponsoring a student to attend a week-long summer art camp at Eastern Illinois University. In order to apply for the scholarship, the student must have a letter of recommendation from our Morris Woman's Club President. If accepted, she will receive a full scholarship from the Illinois Federation of Women's Clubs to attend.